Dell's laptop range covers a broad spectrum of consumer and business requirements, with its Precision range comprising its most powerful high-end mobile workstations. Packing cutting-edge components and performance, the Precision M4500 sits in the middle of the range and aims to offer a compromise between compact mobility and big-screen graphics power.. Billed by Dell as 'the world's most powerful 15.6-inch mobile workstation', we expected nothing less than the holy trinity of laptop design from the Precision M4500 – portability, performance and usability. Thankfully Dell has succeeded and, despite some very minor complaints, the Precision M4500 is one of the best workstations you can currently buy. 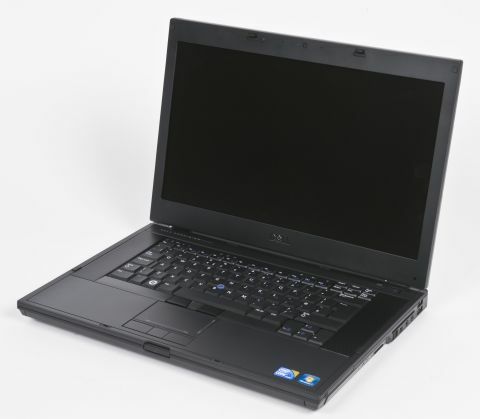 While Dell's corporate laptops often come from the same school of design as Lenovo's ThinkPad range – with plain black plastics used throughout and very little design flair on show – the Precision M4500 is more pleasing to the eye. Finished with a ribbed, brushed-aluminium lid, it carries a high-end corporate look that will fit nicely into any office environment. The interior of the Precision M4500 is less eye-catching, with matt black plastics used liberally, but when combined with the aluminium lid it creates an impressive level of resilience that will easily withstand years of daily use. Entirely scratch and smudge resistant, with no noticeable flex on the lid or any of the panels, this is one of the toughest laptops we've seen. The Dell Precision M4500's chassis is not as well equipped as we were expecting, however. The left-hand side of the chassis is fitted with just two USB ports, an ExpressCard slot, an SD Card reader. we would have preferred an HDMI port, as compatibility for DisplayPort technology is so rare. The right-hand side of the chassis is far better equipped, with two more USB ports, a mini-FireWire port, an SD Card reader and a standard PC Card slot. A DVD rewriter is also in place, with the unusual ability to be quickly hot-swappable. A compact handle pops out of the drive and can then be pulled to remove and replace the drive while the laptop is switched on. Despite having a comparatively large chassis, the keyboard of the Precision M4500 is not as large as we'd expected. Rather than span the width of the machine, two large speakers are fitted on either side, reducing the keyboard's size. Audio quality is excellent, however, with a surprisingly powerful and warm sound that can easily fill a small room without straining. The keyboard itself is one of the best we've used of late, although its lack of a numeric keypad is unusual for a business machine. With large, firmly fixed keys and no flex on display at any point, we were able to type accurately and comfortably all day. Our only gripe is that the board is set quite far back on the chassis, forcing you to lean forward slightly when typing. As with such rival corporate machines as those from Lenovo's ThinkPad range, both a touchpad and pointing stick are in place for controlling on-screen actions, each with their own set of dedicated mouse buttons. Both also include a third mouse button in the centre, which can be clicked to allow you to easily scroll up and down inside documents and internet pages.